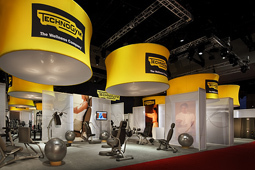 The purpose to this project was to create overhead lighting, branding elements and a wall a panel system for a trade show exhibit for TechnoGym, a fitness equipment manufacturer. 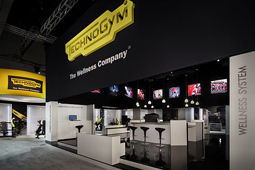 TechnoGym’s objective was to create a strongly branded environment that included private and semi-private meeting and product display spaces conducive for sales activities. 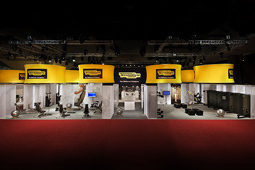 • Corporate branding and product down lighting are provided through a dual-purpose fixture: sixteen custom, internally illuminated suspended light fixtures. • Individual product areas were defined—without creating a closed-in feeling—with a lightweight and transparent panel system. Components: Powernet fabric and powder coated extrusion. • Black fabric soffit panels with a large corporate logo on each side—defined the central meeting and hospitality pavilion. 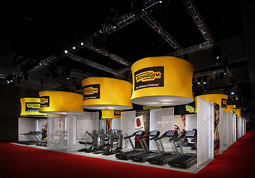 Large photographs of people engaged in fitness activities ringed the interior-facing side of the soffit. 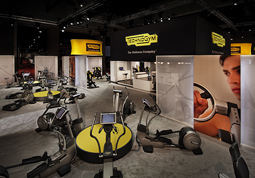 This was an intensely collaborative project, with contributors including team members from TechnoGym (corporate headquarters located in Italy), an Italian architectural firm, the TechnoGym U.S. marketing team and TPN (TechnoGym’s US based exhibit house). The show contractor was Freeman, and they visited to plan for a smooth installation. Members of the team from both Washington State and Italy gathered in Transformit’s Maine facility to discuss the design concept, which led to Transformit engineering the final lightweight, sustainable and cost effective solution.